In “The Receding Tide of Medical Malpractice Litigation” Professor David A. Hyman University of Illinois, School of Law and School of Medicine, Professor Bernard Black Northwestern University, Law School and Kellogg School of Management, and Myungho Paik Northwestern University, School of Law look over 20 years of national trends in Medical Malpractice Llitigation in cap and non cap states. 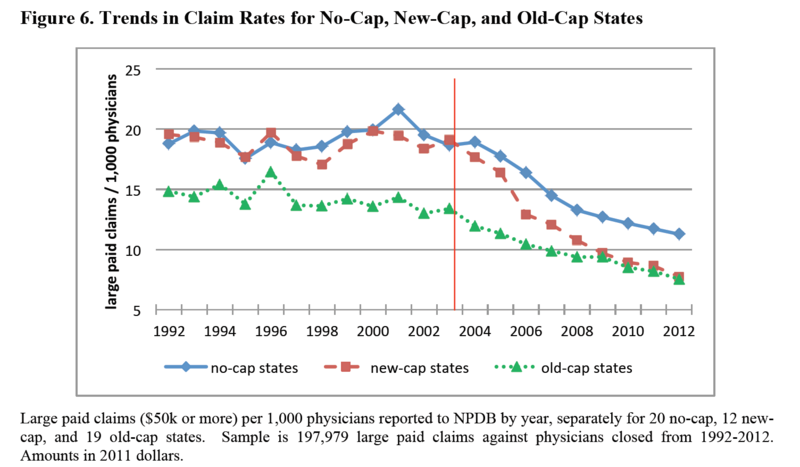 The study shows a substantial decline of Medical Malpractice Litigation nationally both in cap and non cap states. 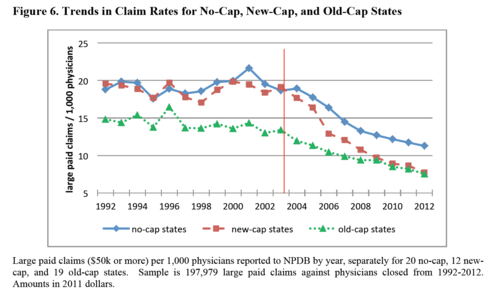 The aggregate payout by physicians represents now 0.1% of health care spending. The dollars directly at stake in med mal reform are small and the introduction of a national cap would only bring negligible savings.